A magical story of forbidden love, spanning three continents and three decades. Set against the Independence struggles of two British colonies, Of Marriageable Age is ultimately a story of personal triumph against a brutal fate, brought to life by a colorful cast of characters . . . Savitri, intuitive and charismatic, grows up among the servants of a pre-war English household in the Raj. But the traditional customs of her Brahmin family clash against English upper-class prejudice, threatening her love for the privileged son of the house. Nataraj, raised as the son of an idealistic doctor in rural South India, finds life in London heady, with girls and grass easily available… until he is summoned back home to face raw reality. Saroj, her fire hidden by outward reserve, comes of age in Guyana, South America. When her too-strict, orthodox Hindu father proves to have feet of clay she finally rebels against him... and even against her gentle, apparently docile Ma. But Ma harbours a deep secret… one that binds these three so disparate lives and hurtles them towards a truth that could destroy their world. Sharon Maas was born in Georgetown, Guyana, in 1951. She was educated in Guyana and England. After leaving school she worked as a staff journalist at the Guyana Graphic and the Sunday Chronicla in Georgetown. Sharon has always had a great sense of adventure and curiosity about the world we live in, and Guyana could not hold her for long. In 1971 she set off on a year-long backpacking trip around South America. Her travel articles were published in the Chronicle. In 1973 she travelled overland to India through Europe, Turkey, Iran, Afghanistan and Pakistan, and spent two years in an Ashram in South India. 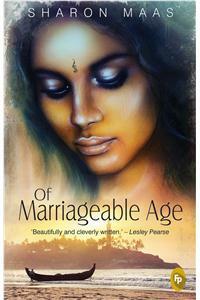 Her novel, Of Marriageable Age, is set in India and Guyana. At present she works as a Social Worker in a hospital in South Germany.